The kart is in decent contition with no race days on it , iv measure the chassis and fount it just fine . anyone else had an interpid chassis before ? are they compratible with other well known chassis so i can buy parts from them and fit it to this if i got problems ? any general oppinions for interpind as a brand ? stamatis . evia island . greece . 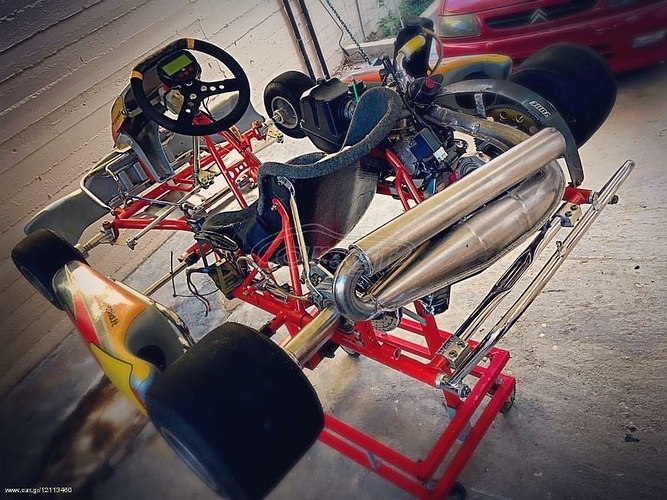 I don’t have any specific experience with Intrepid, but they have built some very good karts. Do you know how old this kart is? Looks to be about 10 years old or so. Looks like the same as my Intrepid Silverstone. 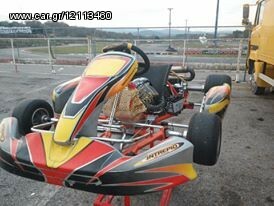 I ran it in TaG with IAME Leopard, found it to be a good competitive chassis. Intrepids and Italkarts are nearly spot an the same as far as a Silverstone goes. In one of the photos It’s missing the fuel tank. In that photo paint color does not look stock. In the second photo, fuel tank is on the kart and paint color looks as it should, stock. One other thing, was it re-painted? It doesn’t look like the original color, and looks to be missing name brand stickers on the front frame tubes. new paint could be hiding frame wear or other damage. Thanks a lot. Mates, thats great help.